The BRIC Celebrate Brooklyn! Festival is a beloved summer tradition, presenting world-class free music, dance, and multimedia performances at the Prospect Park Bandshell. CHECK OUT THE BENEFITS OF MEMBERSHIP BELOW! Individual memberships are sold per person. Customize your pass by buying multiple passes. Get your Summer Friends Passes before they Sell Out! 0 tickets left! Available For 113 More Days! 147 tickets left! Available For 113 More Days! 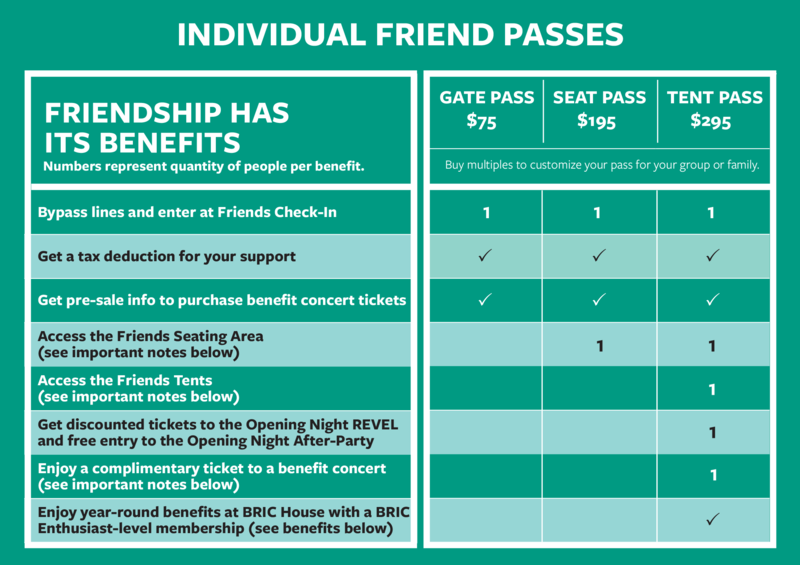 Express entry at FRIENDS Check-In, access to benefit show pre-sales, and reserved Friends Seating areas. 216 tickets left! Available For 113 More Days! Available For 113 More Days! Tent-level members can purchase Kids-Tent Passes at this discounted rate for kids ages 2-12. Tent-4 Pass, 4 benefit show comp-tickets, 1/8-page season program ad, promo night, networking, and more! Tent-6 Pass, 6 Benefit show comp-tickets, 1/4-page season program ad, promo night, networking, and more! Tent-6 Pass, 6 Benefit show comp-tickets, 1/2-page season program ad, promo night, networking, and more! Tent-6 Pass, 6 Benefit show comp-tickets, FULL-page season program ad, promo night, networking, and more! Introduce your small business to over 175,000 audience members throughout the season. Business Friends get a color ad in the Season Program and an ad/link on our website for a full year. Plus, Business Friends get to market their business in the Friends Tent by providing samples or promoting services during a show of choice. *For details on Small Business Friends Memberships, CLICK HERE. BRIC is committed to strengthening neighborhoods and communities. Small Business Friends, therefore, are defined by BRIC as any local business with less than 25 employees and three locations. For information on other partnership or sponsorship opportunities for your business, please contact sponsorship@BRICartsmedia.org. PLEASE NOTE: All Business Friend ads must be received by May 1, 2019 in order to be featured in the Season Program. Discounts for Kids: Tent-level members may purchase Tent Passes at a discounted rate for children ages 2-12. Purchase a Tent 4-Pass or higher and receive invitations to special events and complimentary tickets offers throughout the year. Purchase a Tent 6-Pass or higher and entertain your group with a special complimentary dinner in the Friends Tent at one performance. Benefits include: Members-first notification of BRIC House programs; 15% discount on Media Classes; 10% discount at the café in BRIC House; advance BRIC House ticket sales and reservations; and discounted tickets to the Fall Gala After Party. BRIC is excited to announce a new food vendor for this summer! This vendor will feature a variety of tasty options from local restaurants.